GENERAL SANTOS CITY - The military has assailed Tuesday the New People's Army for its continued use of landmines and improvised explosives while conducting tactical offensives against government troops. Lt. Col. Lyndon Paniza, spokesman of the 10th Infantry Division, said communist rebels detonated over the weekend an improvised explosive device on a military vehicle carrying troops belonging to 101st Division Recon Company in Barangay Malinawon, Mawab, Compostela Valley. The soldiers were on their way home after extricating the body of a slain NPA rebel killed in an encounter with government troops in sitio Tagaytay, Barangay Mipanagi, Nabunturan, Compostela Valley. "This is another form of cowardice and treachery displayed by NPA rebels when they used the internationally-banned improvised landmines against troops of 101DRC", Paniza said. He said the use by the NPAs of improvised landmines violates the Canada and the International Movement to ban landmines as prescribed in the Ottawa Protocol and the Comprehensive Agreement on Respect for Human Rights and the International Humanitarian Law (CARHRIHL). Paniza said a fifteen-minute gunfight ensued after the explosion that killed 1st Lieutenant Godofredo A. Despojo Jr.
Paniza said military recovered the remains of the slain NPA rebel who will be accorded a decent burial by relatives. He said most often NPA rebels abandon their slain comrades during encounter denying families and relatives of the chance to give decent burial to the deceased. Meanwhile, the NPA has claimed that soldiers belonging to the 27th Infantry Battalion and 39th IB have been killed in a series of attacks in Davao del Sur and Sultan Kudarat provinces. Ka Macario Dilaab, spokesperson of NPA's Mt. 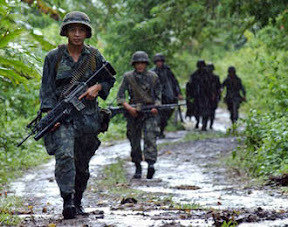 Alip Operations Command in Far South Mindanao region, said NPA snipers attacked the soldiers guarding the mining areas of Xstrata-Sagittarius Mines Inc. and its peripheries located in Columbio, Sultan Kudarat and Magsaysay, Davao del Sur and in Columbio, Sultan Kudarat. Dilaab claimed that NPA snipers hit a column of 27th IB in Brgy. Tagaytay, Magsaysay Davao del Sur who were conducting a military operation. Residents declared that there were at least four casualties who were brought to the hospital, passing by Brgy. Sucob, Columbio in Sultan Kudarat. He said an encounter was mounted last week by the NPA guerillas in Lam-agul, Brgy. Bacungan, Magsaysay against another column of the 27th IB. In the afternoon of the same date, the NPA snipers hit another column of the government troops in Brgy. Maligaya, Columbio, Sultan Kudarat. He said another sniping operation was conducted against the marauding 39th IB soldiers in Brgy. Colonsabak, Matanao, Davao del Sur. He said local villagers reported that there were two casualties on the side of the 39th IB. He said the NPA did not suffer any casualty during the offensives.